So this afternoon I went over to the Cascade 220 portion of my yarn stash (as one does), to grab a single skein of something that I could use for a new small project. And while I was there I thought “you know, I should really catalog this. Maybe even enter it in my Ravelry stash. I have a lot of Cascade 220.” So I did, marking the first time I have ever entered any of my yarn on Ravelry that is not my own handspun yarn (and dudes, it’s been a while since i had a new skein of my own handspun yarn). And I’ve been working on the hood for my Gwendolyn cardigan, which is basically the last step except for the button band, and sort of eyeing that last skein a little bit wondering if I’ll make it, and do you know what I found in my shelf cubbies of Cascade 220? 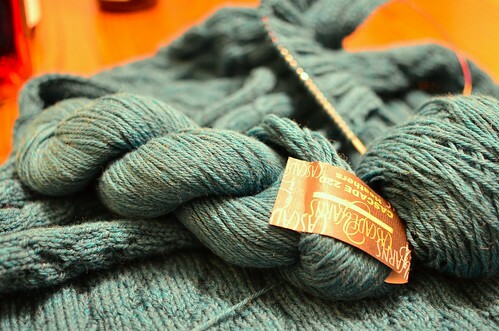 I found one last skein of yarn, in the same batch I bought for my Gwendolyn cardigan. Stashes are evil like that sometimes. It was just holding that skein back to make you sweat. Oh..that stash is luscious!! Enjoy and show the pretties you will create!! That is so exciting! I’m glad you have enough yarn. Obviously the yarn gremlins hid that skein from you. you are certainly lucky on this ‘leap’ day of Feb 2012!!! That is great!!! I haven’t logged all of my yarn yet, I really need to do that so I can assign projects to the yarn. I can’t wait to see your finished project. Is…is that your stash in the picture? 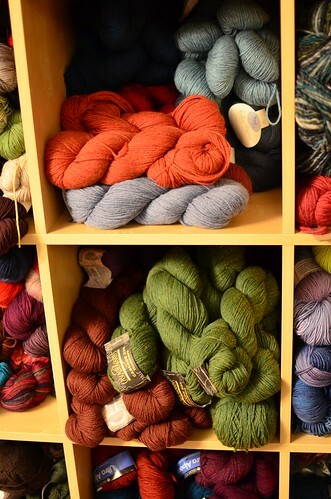 I’m a relatively new knitter from a smaller city, and that picture makes me think that your stash is about the same size as the selection at my nearest LYS. Wow. It is indeed from my stash! 😉 I’ve cultivated it over many years and decided to start storing it where I could see it, so now I have a big square-cubby IKEA shelf on one wall, and have it sorted by weight. It’s wonderful! First time to comment but I’ve been reading your blog for a few weeks and love it…but the STASH made me open my mouth! Beautiful! I teach knitting (lace, charts etc.) and have my knitting room and display my stash behind pantries w/ big glass doors. Don’t you just love going in and touching it all! Or sitting and thinking, ‘hmmm. Where’s that yarn I bought last year in Wooster,,,?’ Thank you for a good blog! a lucky leap year day indeed!! love that heathered yarn, it looks amazing. That’s your stash? It looks a little more like a yarn store shelf. Love the cubies. Love the stash. I was also thinking about putting the stash in the open so that I could see what I have so I was looking at the cubies at IKEA just last week. Can you tell me which one you got? TOTALLY JEALOUS of your stash! Are you sure it wasn’t leprechauns trying to get in a little early mischief? Isn’t their favorite color green? Glad you found that extra skein. Can’t wait to see the cardigan finished. I dream of a creative space like yours. Maybe someday! why, yes…I do have my own stash, but don’t have the courage to photograph it…someone might say that I should not continue enhancing it and then where would I be – lost without a personal yarn shop…though admittedly, when I looked at yours, I did think…I wonder which LYS that is????? 😉 happy shopping! What’s not to love about a stash! Mine is tiny tiny but I like to knit with brand new yarn! 😉 Your Cascade in green is lovely! So, I keep checking back here hoping to see your finished Gwendolyn. I know it’s not fair to rush you–you’ve got a full life that includes more than just knitting and blogging–but seeing new content, especially WIPs and FOs, is a real bright spot in my day. I love your stash too — well, not the wooly parts, but the organized aspect from both your yarn choices to the artful storage. My stash aspires to such greatness! Hooray! What a great find! Your stash is the envy of all knitters! Very cool. Also loved the retreat photos from your last post. I really like how you have your stash ordganized, and I like the idea of having it all out in the open. Mine is (mostly) in plastic tubs onder the bed (for now). One day it’ll move into the light of day! I simply adore Cascade 220 yarn…especially the Heathers. I just finished a sweater in #2425 (called Provence). It’s so lovely! I just bought some Cascade Superwash to try.